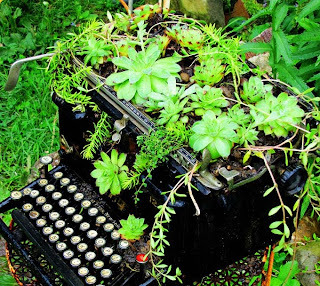 Shop@MustardSeed: How many typewriters does it take to .... ? How many typewriters does it take to .... ? .... change a light bulb? Recite the complete works of Shakespeare? Do the gardening? If you think you know the answer, then call 0419-419419 (calls route through to Nigeria - so have your bank details ready) - and you may win a pot plant. Just don't tell the drug squad. Amongst evolutionary biologists and geneticists, typewriters are the 2nd most studied subjects (after identical twins ) - ever ; and recently published articles now conclusively show that the QWERTY gene was simply an advantageous mutation that conferred on typewriter demonstrators the symbiotic ability to tap out TYPEWRITER along the top row without the keys jamming up. Yes - the inevitable explosion in typewriters (and jammed up lower keys) did lead to beneficial spin-offs (alphabet spaghetti) but also trade-offs (jam rationing). However - only now coming to light are the more complex side affects of the QWERTY mutation. Did you know that pessimistic words tend to contain more letters typed with the left hand - whereas right hand letters are favoured when tapping out growing and gardening terms? The illustration shows what can happen when only the right hand is used for extended periods of typing. Impressive eh? And also a wonderful antidote to left hand induced negativity. 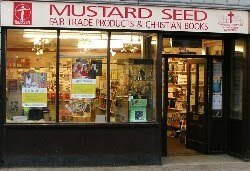 But - on International Bagpipe Day - what does all this have to do with the price of mustard seed? Well - think about it. We're clearly on the brink of a new green revolution. 90% of the population is right-handed. These people all pick up their smartphones and tablet devices with their left hand - and then type exclusively with their right. The affects - when they hit - will be blooming dramatic, and "Green fingers" will take on an entirely new meaning. Yep - it's Apples & Blackberries going bananas on Orange. So we need to - Be Prepared - as Baden-Powell would have said at this point..
On a blooming android smart phone? On a blooming android smart phone. Finally - while we're still on the green fingers theme : a customer (called Hector) came into the Mustard Seed yesterday and was clearly impressed by the range of gardening goods. "Man, you're really green!" he exclaimed. Manure is actually brown - but I think I know what he meant. P.S. In the video above, the toy accordion on the left is played by Hector. The bigger accordion on the right is played by Hector. There is only one Hector. Gardening is cheaper than therapy!